When the membership department at SAM was running out of fulfillment materials, the creative team delivered an entirely new membership campaign. We realized that behind everything SAM does—and behind every reason members might give for why they joined—was the love of art. So we decided to celebrate that love. And SAM members. Because who wouldn't want to hang out with these guys? I wrote a call to members, asking them to participate in a survey ("It's quite possible the coolest thing about SAM is you"). We invited a diverse range of cool members with cool stories to tell to the museum for a photoshoot. While they were there, I did interviews about their memories of museums, why they think art matters, if they make art themselves, what they do for work—anything that makes them + art = true love. Those interviews became articles for SAM magazine, posts for SAM blog, snippets in the e-newsletter, and features on the Join and Give portion of the SAM website. And then—then, finally—we made the fulfillment materials. 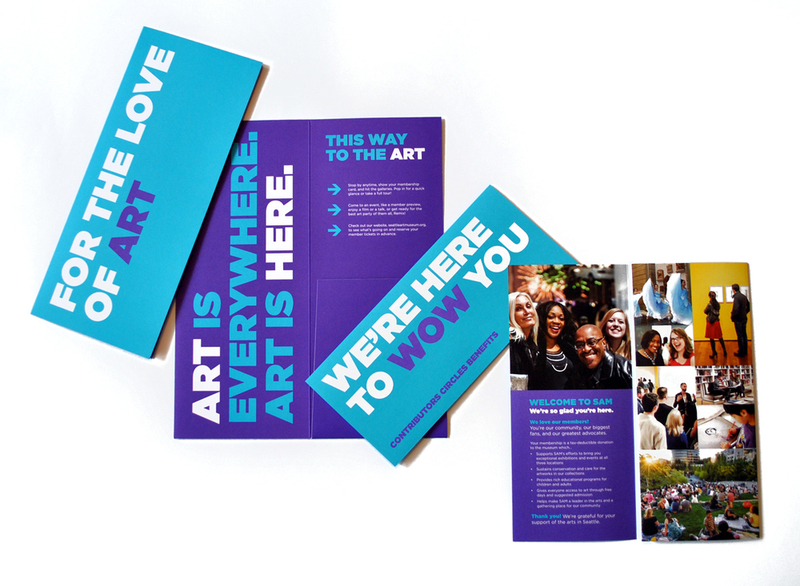 For the Love of Art is a membership recruitment and retention campaign. The pathway is something like this: See an amazing, cool person who looks like they could be your friend in a newsletter, blog post, or social media image, talking about why they love art. Think about why you love art. Think about how much easier it would be to see art all the time if you were a member of the Seattle Art Museum. Sign up for a membership—and get these bright, happy and bold fulfillment materials in the mail that promise "We're here to wow you".